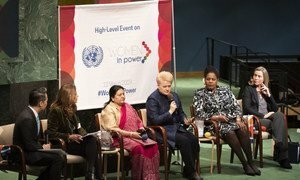 Participants celebrate as the UN Commission on the Status of Women successfully wraps up its 63rd session at UN Headquarters in New York. The 63rd session of the Commission on the Status of Women (CSW63), which traditionally brings women’s rights advocates from across the world to United Nations Headquarters in New York for two weeks of intense dialogue, expert panels and partnership events, concluded with a strong commitment by UN Member States to ensure that services, infrastructure and social protection systems are designed and delivered in ways to prevent discrimination and create a ‘level playing field’ for women and girls. The meeting opened on 11 March with statements from a wheelchair-bound Pakistani mother who yearned to visit a park without worrying about ramp access, and a young South Sudanese woman who dreamed of having affordable health care.